Throughout 300 Fantastic Facts Animals, there are activity panels and quiz questions for kids to test their new knowledge and to challenge them to remember all the amazing facts they have read so far. 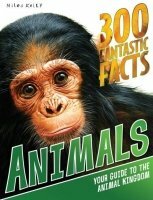 300 Fantastic Facts Animals is a complete guide to the animal kingdom for children. Some fantastic facts that can be found inside include: • The tiny mouse deer is only the size of a hare. Also known as the chevrotain, this little creature is only about 85 centimetres long and stands about 30 centimetres high at the shoulder. • There are more than 950 different types of bat. They live in most parts of the world, but not in colder areas. • Most whales are born tail first. If the baby emerged head first it could drown during the birth process. Quiz questions and activities for kids from 300 Fantastic Facts Animals: • Take a sheet of paper and trace as many predators from this book as you can find. Colour them in and put a big heading – PREDATORS – to make a predator poster. • What does the red panda eat? • Make your own food chain – draw a picture of a large carnivore such as a lion and tie it to a piece of string. Then draw a picture of an animal that the lion catches such as a zebra. Hang it from the picture of the lion, and so on.